Hey R2AK Fans! This morning, we heard from the awesome crew of women aboard Team Sail Like a Girl. 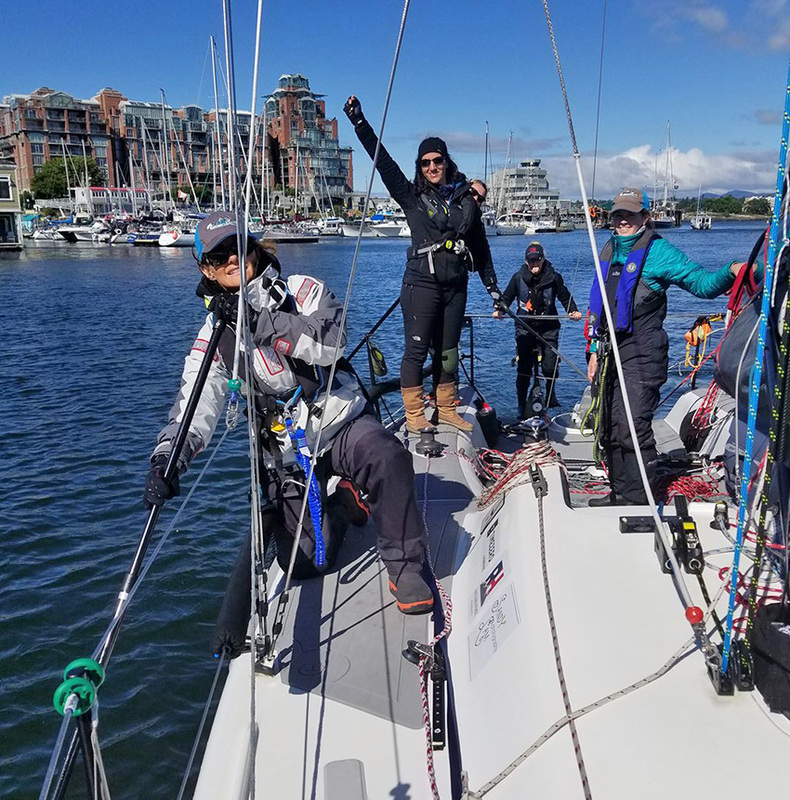 They had a quick trip across the often-gnarly Strait of Juan de Fuca, proving themselves in the eyes of the race organizers (that’s the purpose of this first “qualifying” leg) and the public. Their Melges 32 was plenty fast in the conditions, and they rang the finish bell in Victoria second, bested only by Russell Brown’s Gougeon 32, PT Watercraft (who is unlikely to compete for the top spot in the full race, considering he’s single-handing). Team Sail Like a Girl look like serious contenders after this first leg! These sailors were so pumped about their sail that crew member, Aimee Fulwell, called me when they were still on their way into Victoria Harbour. From the sound of it, there was kind of a lot going on at that moment, so they called back once they were on the dock. I love that enthusiasm and appreciated the effort! Here’s the rundown from Jeanne Assael Goussev, skipper of Team Sail Like a Girl. 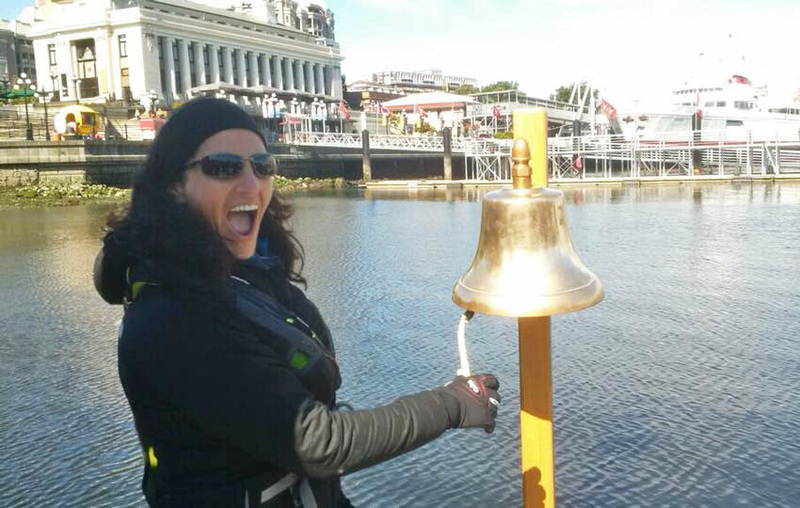 Captain Jeanne rings that bell! “Today was a lot of fun, a really good day…the sun even came out! It was a close-reach, and we crossed in a single tack. We had good speed and great crew work. At the start, we were worried we were a little bit early, so we did a quick tack just before the gun went off. I’ll tell you one thing, that was not a start like I’ve ever done before, with kayaks and row boats in the mix. We got out ahead right away, layed down three or four tacks on the US shore, and had a long crossing on port tack. We started with our #1 jib, and carried it the whole time. We had the code zero up on deck, but never put it up because the wind angle never went far enough behind us. Blue Flash started next to us with their spinnaker up, but they took down the kite pretty early. Our jib reach set-up was very simple, just cracked off from fully upwind: we didn’t even need to use an outboard lead, just standard jib-track lead configuration. Our new main has made a huge difference in our boat speed. It is so different than the main we trained with. In the 8-14 knots we had, everybody was hiking pretty much the whole day. Since it was a single tack across, we had time to stack gear on the high side for some extra ballast. The conditions were surprisingly consistent – we set jack pressure before we left and that setting worked well all day. Although I have probably sailed this boat as many as 50 times since we got it, it has been a while since we were all on board. This entire crew of nine (including Morgana, who is getting off in Victoria) may have only sailed together one time. It was really fun, and I was impressed how well everybody worked together. We’re going to add a solar panel – our lithium batteries should last the trip, but we want an ace in the hole as far as power is concerned. We are also going to be focusing on storage – it is life changing when stuff is off the floor, considering that we have eight of us living on this 32′ boat. Finally, our pedal-drive bikes are on a canting pole so that they can be upright if the boat is heeled, but we have a couple of adjustments to get those settings just right. Today, with two bikes and 4 rowers, we were able to do 3.8 knots over ground. I’m not sure about current effect in there, but we were psyched. Overall, it was a beautiful crossing, the wind was nice and consistent. We had a few riptide areas where things got a little wet. Thankfully, the leak on forward hatch is fixed (we had three cups of water coming in with each wave at Swiftsure). There’s still a little drip down the mast … so we’re not quite dry inside, but we’re working on it. Our big highlight of the day was coming into Victoria. For so many months, we’ve all had this on our minds, and we were really excited to be pulling in here and seeing that bell. To all of our Team Sail Like a Girl fans, we want to encourage you all to get out there, get out of your comfort zone, and have an adventure. You’ll rediscover the strong person you have inside of you! Today was a great start to that experience for us! Making nearly four knots under human power inside of Victoria Harbour on their way to second for the day. Keep your eyes on the tracker this evening, there are a few teams that are still out there and it’s currently blowing 28 knots at Race Rocks. Stay safe out there, R2AKers! Photos courtesy of Race to Alaska and Team Sail Like a Girl.